Try this easy 3 team warmup with your team. Focus on communication, movement, passing to feet and into space, and more with this exercise. Split your players into 3 teams with 1 ball per team. - For the 3 team passing soccer drill, set up 3 grids. - Size of outer boxes approximately 15 x 20 yards (can vary). - The inside square should be 1/3 the size of outside grids. - Split team into 3 teams, and place one team inside each grid. - Have all of your soccer balls with you, outside the middle box. - Pass a ball into team A who has the objective of completing 5 passes, and upon completion then plays the ball through the air or grass to the C team. 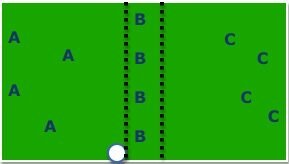 - Upon A touching the ball initially, 1 B player enters the A grid as a defender. If he/she wins the ball OR it goes out of bounds OR a player on B team blocks the cross to the C team, the result would be A team and B team switching. - Following a switch, you play the ball into the C team, while 1 A team player then enters as a defender. The rest of the A team players move into the middle grid and the B players move into the left side waiting for a ball. - Players should ALWAYS be on their toes ready for any ball. - Movement should be constant in each grid, no standing still even if ball is not inside your grid. - All passes should be made accurately, and with good quality. - Teams should communicate together, calling for a ball. - After 5 passes 2nd defender enters, after 10 passes 3rd defender. - Alter grid size, reduce for more difficulty. - Put your goalie in the middle grid, and allow him/her to use their hands. - Put a smaller then normal size goal in the middle grid, points are only awarded if after the 5 passes the team "scores" through the goal and into the far grid.